Edward “Jake” Wagner appeared in Pike County Common Pleas Court Tuesday morning with his attorney, left, and two Pike County deputies. Wagner was denied bond for charges including eight counts of capital murder. The first of four persons charged directly with the massacre of eight members of the Rhoden family in Pike County in April 2016 had his first day in court Tuesday morning. 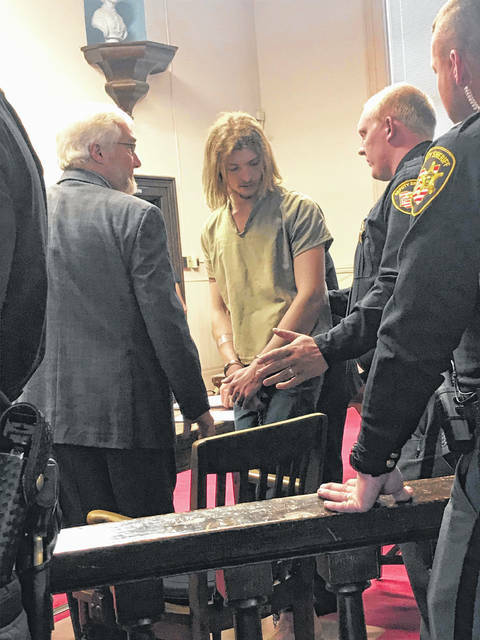 Edward “Jake” Wagner, 26, stood before Pike County Court of Common Pleas Judge Randy Deering, charged with a total of 23 counts, including eight counts of aggravated murder, one for every victim. Each of those eight counts carries three death penalty specifications. Wagner said essentially nothing, only answering yes or no questions from Deering before pleading not guilty to all 23 counts. At the request of Pike County Prosecutor Rob Junk and with no argument from his court-appointed attorneys, Wagner was returned to jail without bail. Two pretrial hearings have been set for Dec. 20 and Jan. 24. Apparently at the request of defense attorneys and with the agreement of Junk, Deering agreed to a gag order placed on anyone connected with the ongoing prosecution of the case, including both prosecutors and defense attorneys as well as investigators and law enforcement officials. None are allowed to speak with members of the media. In fact, following the arraignment, Pike County Sheriff Charlie Reader cited the gag order in politely declining to answer a question from a reporter regarding the identity of one of the many spectators in the courtroom. Those spectators included many surviving relatives of the victims, a few of whom wore T-shirts asking for justice for the Rhoden and Gilley families. Hannah Hazel Gilley was the only victim of the massacre not to carry the Rhoden name. She was the fiancée of one of the other victims, Clarence Rhoden. The parents of yet a third victim, Dana Lynn Rhoden, were in the audience but declined to speak with the media following the arraignment. The arraignment had been set for 9 a.m. Tuesday but got underway about one half hour late. Deering read the entire long indictment list against Wagner, though he read each set of specifications only once. In addition to the death penalty specifications attached to the aggravated murder charges, there are what are commonly called firearm specifications attached to the counts of aggravated burglary Wagner faces for allegedly breaking into the homes where the murders took place. In speaking to the Daily Times on death penalty cases in general, The Ohio State University law professor Douglas Berman, advertised by OSU as an expert in the death penalty, said in addition to having to be found guilty of aggravated murder, capital suspects must be found guilty of at least one of 10 death penalty specifications or aggravating factors. As spelled out in the indictment against him and read into the record by Deering during the arraignment, the death penalty specifications against Wagner include committing an aggravated murder to cover up another alleged crime; committing aggravated murder as part of a course of conduct involving the purposeful killing or attempt to kill two or more persons; and, committing aggravated murder after committing or attempting to commit aggravated burglary and either Wagner was the principal offender in the commission of the aggravated murder or if not the principal offender, committed the aggravated murder with prior calculation and design. Like Edward Wagner, the three other suspects directly charged with the Rhoden murders face one count of aggravated murder for each victim. Each count carries the same three death penalty specifications according to the indictments against them. What prior crime might the Wagner family been trying to cover up? Especially with a gag order in place preventing attorneys and law enforcement commenting, it is impossible to say for sure what the prosecution believes any initial crime might have been. However, prior to the gag order being put in place, Ohio Attorney General and Ohio Governor-elect Mike DeWine stated a custody battle over the daughter of Edward Wagner and Hannah May Rhoden, one of the victims, is central to the case. Each of the four aggravated murder suspects also faces a charge of forgery apparently related to child custody documents. Additionally, Edward Wagner faces one charge unique to his case, sexual conduct with a minor, namely Hannah May Rhoden. One of two other suspects charged in connection with the murders, Rita Newcomb, 65, and mother of suspect Angela Wagner, is charged with forging documents apparently relating to the custody of Edward Wagner and Hannah May Rhoden’s daughter Sophia. In the course of the arraignment, apparently following the advice of his attorneys, Edward Wagner waived his right to a speedy trial. Arraignment dates have been set for the three other murder suspects in the Rhoden case. Next up in court will be George Washington Wagner IV, 27. He was set to be arraigned 10 a.m. Wednesday. Angela Wagner, 48, and mother of Edward and George Wagner IV, will be in court 1:30 p.m. Friday. Finally, extradited from where he was arrested in Kentucky, family patriarch George “Billy” Wagner III, will face a judge 1:30 p.m., Dec. 3. The two other suspects in the Rhoden case were arraigned Nov. 14 and are in fact out on bail, though each are also under electronically monitored house arrest and barred from any contact with the families of the victims. Grandmothers in the Wagner family, Fredericka Wagner, 76, and Newcomb both pleaded not guilty during their arraignments. Both face felony charges of obstructing justice and perjury. The latter charges stem from false testimony the two allegedly presented in July to a Pike County grand jury investigating the murders. As already mentioned, Newcomb also faces forgery charges. Fredericka Wagner is the elder George Wagner’s mother. https://www.mydailyregister.com/wp-content/uploads/sites/24/2018/11/web1_Wagner.jpgEdward “Jake” Wagner appeared in Pike County Common Pleas Court Tuesday morning with his attorney, left, and two Pike County deputies. Wagner was denied bond for charges including eight counts of capital murder.